Heat-resistant glassware – pans, molds, baking pans – more recently widespread. It can be used for cooking in the microwave, in the oven, on the burners of gas and electric ranges. Glassware eco-friendly, not subject to corrosion, does not absorb fat, odors and will not rust. Clear glass allows you to constantly monitor the cooking process and not allow the dish to burn. However, cooking in utensils made of glass has its own characteristics. Glass material is brittle, so handle with heat resistant glassware be careful: do not drop, do not expose to shock, not to put her weight. Failure to comply with these requirements may lead to the fact that you not only lose your favorite glass pots, but also still get a cut from broken glass. Don't forget that glass has poor thermal conductivity. For cooking on the hob gas or electric stoves use glass pans round shape, and the gas burners additional set metal flame spreader. If you put on the round burner heatproof dish oval and rectangular in shape, its bottom will be heated unevenly. In the result, the glass may crack during cooking. Rectangular and oval dishes suitable for ovens and microwave ovens, where the heating is uniform. Before you put the heat-resistant utensils made of glass on the hob, in the oven or microwave, make sure that the surface is dry outside. Do not pour heated pot in cold water and do not put cold foods. Due to temperature changes may crack glass. If during the cooking process there is a need to refill the dish liquid, add it in small portions in the middle of the pan and not on the walls, and constantly stir. Removed from the fire or taken out of the oven glassware put on a special stand, not in the sink and not on the cold stone sill. The food in the glass dish is not burnt in the process of cooking on a gas or electric stove, be sure to pour on the bottom layer of oil or liquid. Cook on low flame for the gas burner on low power for electric. Constantly stir the dish, especially if it has a thick consistency. Heat-resistant glassware can be washed by hand and dishwasher. 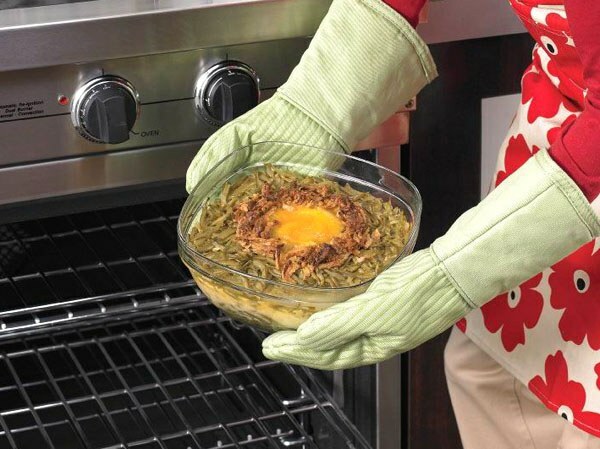 If the food burned, do not attempt to scrape it with sharp objects, steel wool or brushes, abrasive cleaning products. From this, the surface of the cookware is wasted. To remove the burnt residues, soak the pan for a while in water with a mild detergent. When buying heat-resistant glassware please note the quality of the surface. It must be perfectly flat and smooth, without cracks, chips, waves and folds. Glass should be transparent and homogeneous. By purchasing a set of glass pots and shapes of different sizes, choose those that have flat lids with handles on the sides. They will serve you not only as covers but also as shallow dishes and bowls.